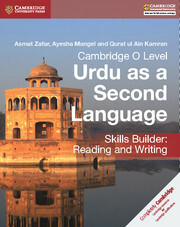 Designed to guide learners through the Cambridge O Level Urdu as a Second Language syllabus (3248), the Skills Builder also covers the reading and writing components of the new Cambridge IGCSE® Urdu as a Second Language syllabus (0539). Created by a team of experienced authors in collaboration with syllabus experts, the Skills Builder contains authentic, culturally relevant material especially selected to stimulate language awareness and critical thinking in teenage learners. Engaging, progressive activities offer flexible support to help students at all levels hone their skills and reach their individual potential, while self-assessment advice and exam-style questions at the end of each unit build confidence in the use of the Urdu language. Designed to guide students through the Cambridge O Level Urdu as a Second Language syllabus for examination from 2015. The reading and writing components of the new Cambridge IGCSE® Urdu as a Second Language Syllabus for examination from 2015 are also covered. Created by a team of experienced authors in collaboration with syllabus experts. Encourages language practice through carefully crafted progressive activities with a focus on reading and writing. Self-assessment advice and exam-style questions at the end of each unit. Contains authentic, culturally relevant material especially selected to stimulate teenage learners. Unit 1 - What should I do? Unit 7 - "I am Karachi"
Unit 16 - Why don't we change? Example answers to exam-style questions.